Cruise the Edge of the North America and experience where the world came full circle for the very first time at L’Anse Aux Meadows, Great Northern Peninsula Newfoundland & Labrador – an event more than 100,000 years in the making where those who went East meet those who went West. The secret is out because 9 cruise ships had scheduled this port in the 2014 season, where they experience the land of the Vikings! As one comes off the port they are first greeted by Leif Erikson (depicted above)who was the first European to land in North America. This statue is one of just 5 in the world, making Lief’s journey and placed by the Lief Erikson Foundation in Seattle. More than 1,000 years ago the Vikings were the first Europeans to re-discover North America as they went further west than any of their ancestors. The Maritime Archaic, Paleo-Eskimo, Groswater Eskimo and Recent Indians were all here on the Great Northern Peninsula from archaeological digs authenticating those who went East to be in Newfoundland around 5,000 years ago but unable to cross the barrier of the Atlantic Ocean. There is a complete history of cultural encounters, great explorers such as Captain Cook, breath-taking landscapes, whales, icebergs and authentic rural people willing to share with you a unique experience. 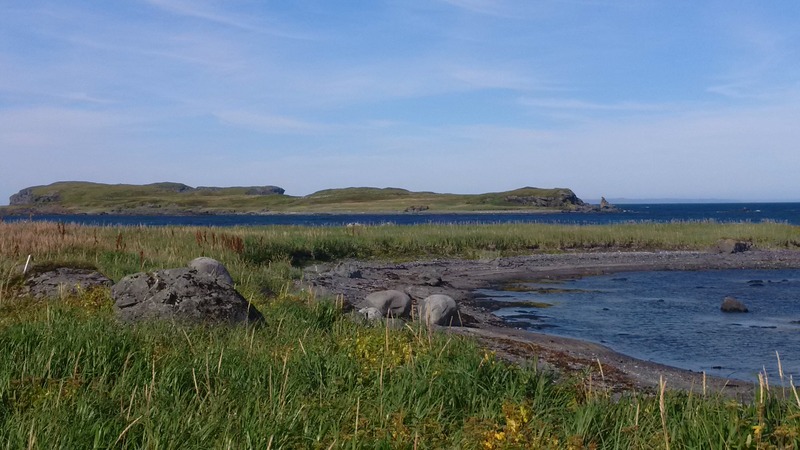 L’Anse aux Meadows is poised for cultural learning and adventure with a World UNESCO Heritage Site at L’Anse Aux Meadows discussing the only authenticated Norse Site in North America. There is also Norstead Viking Village and Port of Trade, which is an open-air museum that enables you to live in the day of a Viking at their site by listening and engaging the rein-actors on site (learn about the Snorri, interactive and learn about weaving, axe throwing, nail making at the forge and more). There are wonderful walking trails, fine dining restaurant and local entertainment provided. Just a short distance up the road one can experience a singing coffee shop that hosts its own radio station of Newfoundland and Country music in Coffee in the Cove. There is a French Oven in Quirpon and a Granchain Exhibit depicting the French culture and influence on the Great Northern Peninsula at the only wildberry economuseum of Dark Tickle Company. Not to mention one can become an honorary Newfoundlander at participating in a Royal Screech-in at Skipper Hot’s Lounge and listen to their band play to dance the evening away! Up the road at more restaurants, live and fresh seafoods and more incredible experiences and this doesn’t even get into what St. Anthony and the Grenfell story has to offer. There is something for everyone to experience when they visit the Great Northern Peninsula by Cruise. I look forward to expanding on this post soon. Posted on October 16, 2014, in Business, Community Economic Development, French Shore, Heritage, History, Landscapes/Geography, Tradition and tagged cruise, culture, experience, Great Northern Peninsula, L'Anse aux Meadows, Newfoundland, tourism, UNESCO, Vikings. Bookmark the permalink. Leave a comment.